Often times when you’re describing your favorite horror anime to a friend, you’ll find yourself talking about your favorite scene right? Sometimes, we find ourselves defining an entire horror series by its best scary anime scenes. Maybe you’ve even HEARD of these awesome scenes, but you never knew which show they were from. Let’s get into the Halloween mood with these chilling moments. You’ve probably seen the meme, but do you know where this scene of stair woe came from? This is the moment things began to go horribly sour in the anime horror Another. Think of it like anime meets Final Destination, and this unfortunate umbrella scene sets the tone for the rest of the (to put it mildly) “freakish” death scenes. Whether you think this counts as a scary anime scene or just a very… very… uncomfortable one, most anime fans will concede that they’ve at least HEARD of this scene. This moment is definitely not for the faint of heart. The Zombie Attack from SCHOOL-LIVE! This deceptively moe show has a few moments of terror, but we think the cake goes to this zombie attack scene. As far as scary anime scenes go, it’s not so much the jump-scare aspect as much as it is the anxiety of watching the girls we’ve come to adore face life-threatening danger. Imagine that you’re going to be tortured to death, and that you really, really want to escape it. Therefore, you do the only rational thing and stab yourself in the head with a knife in the wall, right? Eek. Yamishibai is a series of short stories based on Japanese urban legends and ghost tales. The series uses the “kamishibai” picture-story style, really bringing home the creepy-factor of these haunting five-minute tales. Always stick around for the “punch line” at the end of every episode. Scare Us Up for Halloween! We love Halloween a quite bit much, and scenes like this set the mood for the creepy times ahead. 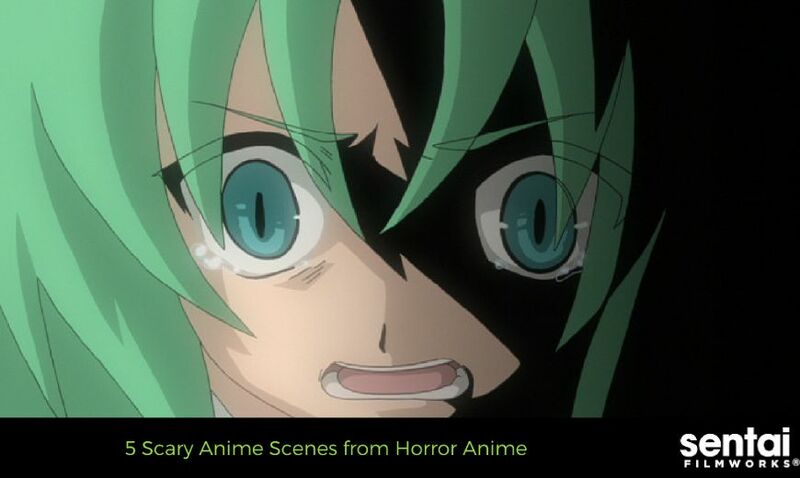 Which are your favorite scary anime scenes? Let us know on Facebook, Twitter, Tumblr, and Google+.